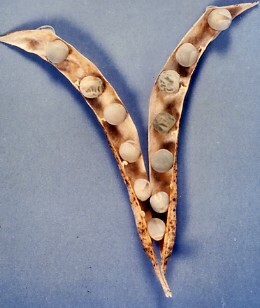 peas are normally self-pollinated because the stamens and carpels are enclosed within the petals. By removing the stamens from unripe flowers, Mendel could brush pollen from another variety on the carpels when they ripened. One-third of the round seeds and all of the wrinkled seeds in the F2 generation were homozygous and produced only seeds of the same phenotype. But two thirds of the round seeds in the F2 were heterozygous and their self-pollination produced both phenotypes in the ratio of a typical F1 cross. The union of sperm and eggs is random. So the pod in the color photo (courtesy of Cathie Martin from Cell 12 January 1990) — with its 9 smooth seeds and 3 wrinkled seeds! — represents something of a statistical fluke. As the size of the sample gets larger, however, chance deviations become minimized and the ratios approach the theoretical predictions more closely. The table shows the actual seed production by ten of Mendel's F1 plants. While his individual plants deviated widely from the expected 3:1 ratio, the group as a whole approached it quite closely. So if a generalization is valid, then certain specific consequences can be deduced from it.